I didn’t write down our tour guides name but she was amazing . We had our 12 year old granddaughter with us and she kept her engaged the entire time ( she used her name and kept her involved- I was very impressed. We saw alll the things we wanted to and couldn’t be more pleased . 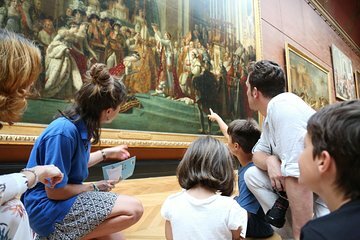 This was a nice overall tour to see the highlights, so the parents could experience the best of the Louvre with little kids. There seemed to be some confusion and a missing tour guide before our tour started so we started late, which then made the rest of the tour feel a bit rushed, but I think this was a concentration issue since 3 of the other groups were off on time. Our guide was EXTREMELY knowledgeable! THe other family in our group had a teenager and we had a 6 year old, so I think the age gap was a little much for the tour guide to know how to keep both kids engaged. I would recommend they get the ages of the children ahead of time and have groups pre-determined based on age so they kids maybe can interact more and the guide has an easier time talking to all of the kids. My son got reallllly bored at times because the book they gave to go along with it only had a few pages that were good for a kid that can't read yet whereas the teenager didn't really open her book at all since it was way too young for her. The books have the right idea, but could be done a little better. I think if you want to be able to explore the museum a little more afterward, you should try for the earlier tour. We had to rush through one or two exhibits we knew we wanted to see after because with starting late and it closing at 6, we didn't have much time after the afternoon tour concluded. Overall, I still think it was a good option for kids between 7-12, but I may have just gone with a regular small group skip the line tour and made my own thing for my son to do while in the museum since the price was so much higher for this. Great tour. Enthusiastic guide. Ended up being just me and my 8 year old. Guide made it fun and exciting. She was excellent with my tired a bit crabby daughter. Highly recommend this if you have young children. We had a private guide and we had a young baby in our group. She did a great job but moved at a very quick pace and we ended a little early although that was fine for us because we were all exhausted by this point. We saw most of the major attractions and she made sure to cover anything we personally wanted to see. Overall it is a trip I would recommend. Thankfully our child was in a stroller but young walking children would struggle with this tour I think. Our guide Victoria was phenomenal. Pleasant, informative, interactive. An excellent experience. I would give her 10 stars! My 5 year old son loved visiting the Louvre, thanks to this tour. Having someone to navigate us through the museum, and talk about the history and art in a way that is accessible for children, made this tour worth every penny. Wonderful tour for kids! The guide made the paintings and sculptures come alive for 3 boys 4th - 7th grade and kept them engaged and entertained for the entire time! Tour guide was fantastic! Met the guide out in front of the Louvre and quickly made our way inside, not waiting in line. Our children range in ages from 7 to 15, and each found the tour engaging. Books were provided for the children as well. Finally, the length of the tour was just right - enough time to see the highlights, while not exhausting the kids. Highly recommend! Lots of stairs--with a child who is shy, the Louvre was overwhelming. I enjoyed the commentary, not sure how much my granddaughter age 10 got out of it. The guide made a very good effort, though. Skipping the line and having someone navigate us around is the only way to go unless you love studying the floor plan and treating this as a military mission. I have taken several tours with Viator and I would NOT recommend this tour. We booked this tour with our two children, ages 7 and 9, because the tour was supposed to be suited for children. The tour guide likely would have been well suited for an adult tour but was not for children. She did not engage the children at all. The children became bored and totally lost interest in what she was saying. My 9 year old daughter loves art and could not wait to see the Mona Lisa the tour guide told us absolutely nothing about it but just waited while we braved the crowds and looked at it ourselves. Eventually we just ended the tour early because it was so bad. I would not book this again and I would be hesitant to book any Viator tour for children based on this experience.